Davis Library at the University of Rio Grande & Rio Grande Community College has been a member of the United States Federal Depository Library Program (FDLP) since 1966. You can learn more about the FDLP here. As a selective depository, we receive approximately 14% of the items distributed to participating libraries via the United States Government Printing Office (GPO). Content for this LibGuide was adapted, with permission, from previously created guides by the librarians at Miami University and Shawnee State University. Davis Library provides free, equal, and unrestricted access to government information for all of our library users both from our campus community and the general public. If you're just getting started, you might want to take a look at our popular resources. You might also want to visit our library catalog (RioCat) to search and access the "basic collection" offered by all Federal Depository Libraries. Where is Government Information Located in Davis Library? The majority of govern ment documents today can be found online. 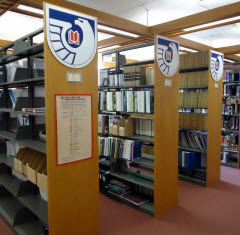 However, if you're looking for a physical copy, all print resources available in Davis Library are organized by SuDoc number and are located in their own designated shelving area on the library's Main Floor. Since many of these items aren't listed in RioCat, use the Catalog of U.S. Government Publications to get the SuDoc number(s) for the information you want. The SuDoc number acts as a type of address and will help you locate the item in our print stacks or in our microfiche collection. If Davis Library doesn't offer the item(s) you seek, then please consider utilizing our Interlibrary Loan (ILL) or OhioLINK services to request and borrow the information. The delivery process for these lending services usually take about a week to ten days to complete. For (possibly) more immediate access to print resouces, use the Federal Depository Library Director (FDLD) to locate and/or get contact information for other FDLP libraries in your area. Another FDLP library may have the item you seek in their collection and be willing to fax or email you a copy if you're not able to visit their library in-person. The State Library of Ohio in Columbus is a fantastic FDLP library, holding over 1 million government publications dating as far back as the 1700s. Many, if not all, of the resources available after 1976 can be found online. Catalog of U.S Government Publications - The finding tool for descriptive records for historic and current publications from the Government. Statistical Abstract of the United States - A statistical reference and guide to over 250 statistical publications and sources from government and private organizations. We have this resource in both a print and electronic format. Congresssional Record - The official record of the proceedings and debates of the United States Congress. It is published daily when Congress is in session. FDsys contains Congressional record volumes from 140 (1994) to the present. At the back of each daily issue is the "Daily Digest," which summarizes the day's floor and committee activities. Public Papers of the Presidents of the United States - This resource is compiled and published by the Office of the Federal Register, National Archives and Records Administration. Beginning in 1957, the Public Papers began after a recommedation by the National Historical Publications Commission established an official series in which Presidential writings, addresses, and remarks of a public nature could be made available to the public. U.S. Government Printing Office - The GPO is responsible for the production and distribution of information products and services for all three branches of the Federal Government, including U.S. passports for the Department of State as well as the official publications of Congress, the White House, and other Federal agencies in digital and print formats. Ben's Guide to U.S. Government for Kids - a great resource for learning or teaching about how our government works. Want to Find More? Use the tabs found at the top of this guide to get details on and links to more online Government Resources. Then, see our list of Helpful Databases under the Popular Online Resources tab for more search options.